I think Danielle is the underdog vs the other three. One thing that I have noticed since the departure of Tim and then Tommy is we are learning on the fly and I believe to much is slipping though the cracks by not having an experienced person in the AD job. There is little to no marketing of the games, the game day atmosphere inside the event is down and there are fewer corporate and game sponsors. I just don't feel like its buttoned up like it had been in the past. Completely agree! A lot of the “little things” are being missed too. Simple things like keeping the website updated and creating social media buzz. Misses that display either a lack of experience or a staff stretched thin. I understand several folks are doing double duty until a full AD is added. But attention to detail still needs to be a priority. I'd like to know more about Bubb. With his family here and being an Alum, this would likely not be a temp job for him. Some stability would be a nice change. According to his facebook page, he's originally from Ipava. He has one daughter who works in WIU's Visual Production Center (I used to work with her at Document and Publication Services) and another daughter who teaches at St. Paul School and was my daughter's 2nd grade teacher. I think there's one other daughter, but I don't know her. Between the two I do know, there's 3 young grandkids in Macomb. I think it'd take quite a bit to pry him away from the area, although I don't know how close he might be to retirement. That being said, I don't know him personally, and I haven't looked into how successful he was at his various positions. thanks for sharing this, i am impressed with what i read. He does sound like he has experience in fundraising, which is needed. As a former basketball coach, I wonder what he thinks of our basketball program. The age thing is a concern would be nice to have some stability, but then again if you hire a younger person, they might not stick around very long either looking to move up. 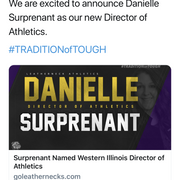 I think Bubb and Danielle both would probably be content at WIU. Maybe it is just me, but I want an AD who demonstrates passion during games. IIRC, TVA was like that. If an official made a seemingly bad call, TVA was on his feet yelling at the official just like some of the fans in the stands. Or at least that is my memory of him from the few times both he and I were at the same game. The game-day atmosphere was down this year at both the football games and the basketball games. Marketing and Promoting of the games seemed non-existent. A new Board of Trustees could direct the university president to make some changes to the Athletic program. UIS is NCAA Divison 2. Northeastern Illinois has Club Sports. Two thumbs up to whatever AD or administrator went out on a fender and did this back in 2017. I saw this on Jack Houpts twitter feed. Not sure if it was just for one race in Chicago. Also not sure how the race ended up. So did anybody go to the open meeting with the AD candidates or has anybody heard anything on if any of them stood out. Are we back to the drawing board on this or just waiting for the ink on I's and T's to dry? Can’t go with the best choice when you can go with the cheapest one.